Musician Keith Harkin has a surname that suits , to ‘harken’ means to listen and you will find yourself doing just that when the singer /songwriter visits Hobart this week. Many people may know Keith formerly from his time with Irish group Celtic Thunder, who have been frequent visitors to Australia including Tasmania. People may not know that for many years before joining ‘Celtic Thunder’ Keith was a solo performer who joined the group after seeing an ad in the paper when he was in the pub with his dad. Keith loves Australia because he finds Australians share the same dry sense of humour as the Irish. For the last seven years Keith has returned to performing solo and while Celtic Thunder was a slick well-rehearsed outfit, Keith has been enjoying displaying his personality with the spontaneity and adlibbing and acoustic guitar of his solo work. I spoke to Keith last week just prior to his Australian tour and he told me he has friends on the west coast of NSW and Byron Bay and Burleigh Heads where he and his wife spent a six month holiday with friends and he even enjoyed a spot of surfing. Keith says music has always been part of his life from around four years of age. He explains in Ireland music is all pervading because says Keith it’s something everybody can do regardless of their status. Any event is an excuse for music. Children are encouraged to take part in performing early on with events like the ‘Feis’ an Irish festival which encompasses music dance and poetry reading. Inspiration in writing music is found everywhere for Keith in what he reads, observes and in his own life. The writing process can be a visit from the muse or a more protracted process and sometimes it might be a riff, a word or a melody that triggers his writing process. Keith doesn’t mind his music being put into a genre like folk/pop and is always interested in how it is received by audiences. 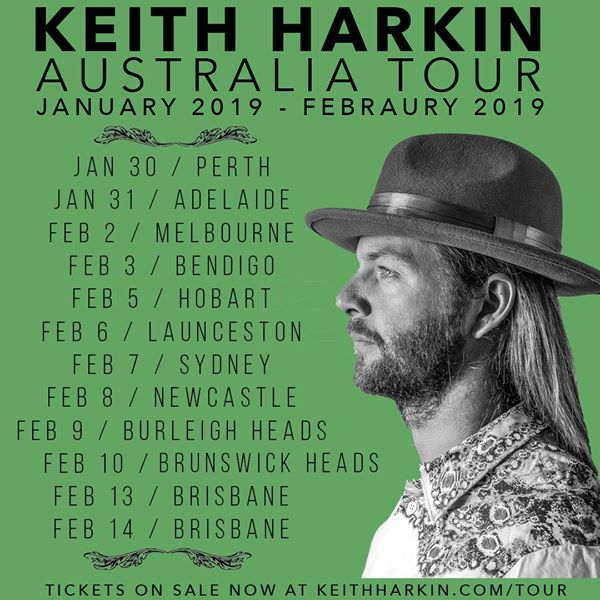 You can make up our own mind by Harkin-ing this message and going to see Keith when he plays in Hobart on Tuesday 5 February at The Republic Bar. Keith Harkin .. what can I say? He is so talented! He sings from his heart and soul .. he never disappoints. Once you have see him you will be hooked forever on his beautiful voice and music. Keith is the real deal .. he has captured my heart forever!